Virat Kohli, who had been dismissed for four successive scores in single digits for the first time in his brilliant ODI career before the World Cup, slammed a 22nd hundred, drawing level with former India captain and opener Sourav Ganguly. Kohli also shared a fluent, 129-run stand for the second wicket with Shikhar Dhawan, who was run out for 73. Kohli now has the second most hundreds in ODIs by an Indian. Sachin Tendulkar, who scored 49 hundreds in his 24-year-old career, is still way ahead of the international pack. 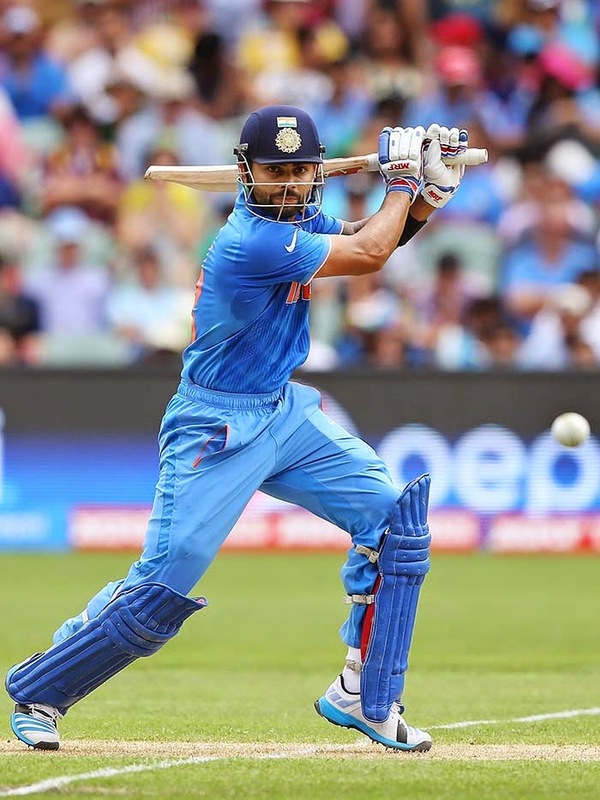 Kohli took only 119 balls to reach his fourth international hundred at the Adelaide Oval. Three of them have been scored in Test cricket. Kohli is now only the first non-Australian to achieve the feat at the iconic venue. More importantly, Kohli became the first Indian to score a hundred vs Pakistan in World Cups - the previous highest was Tendulkar's 98 in South Africa during the 2003 World Cup. The Adelaide Oval has been a happy hunting ground for Kohli. The 26-year-old was obviously happy with his form here. "I want to wrap up this ground and take it home with me," he said after his hundred had piled up 300/7 off their 50 overs. India were on course for a bigger total but a five-wicket haul by Wahab Riaz restricted the world champions. 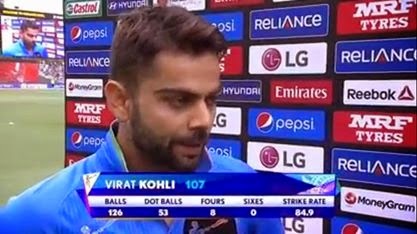 But Kohli felt it was still a competitive total. "The wicket is two-paced and the way Suresh Raina (74 off 56) batted was magnificent. Am happy we got to 300 because it gives us a psychological advantage," Kohli said. As far as his own form was concerned, Kohli said he was never too worried. "In the tri-series and warm-ups, I was trying to hit too much. Today, I wanted to give myself more time and play the anchor's role. This knock is really special for me." Kohli had been in the form of his life in the Test series vs Australia, hammering four hundreds in four matches. But his run scoring abilities took a sharp dip once the tri-series started and it raised a lot of concern for Mahendra Singh Dhoni's men. To make matters worse for the Delhi dasher, Kohli was shuffled down to N0. 4 in a bid to be protected against the new ball in case of an early wicket. There were several questions asked about the move but certain former players and captains defended the tactics. However, Kohli batted in his familiar No. 3 slot against Australia and Afghanistan in the World Cup warm-up matches and it was no surprise when Dhoni's deputy walked in to bat at one-drop when Rohit Sharma perished to Sohail Khan with the scoreboard reading 34/1 in 7.3 overs. Once he was out in the middle, there was no looking back. Kohli was not looking back at his abysmal form and nor was he thinking of the poor shots he had played Down Under so far. 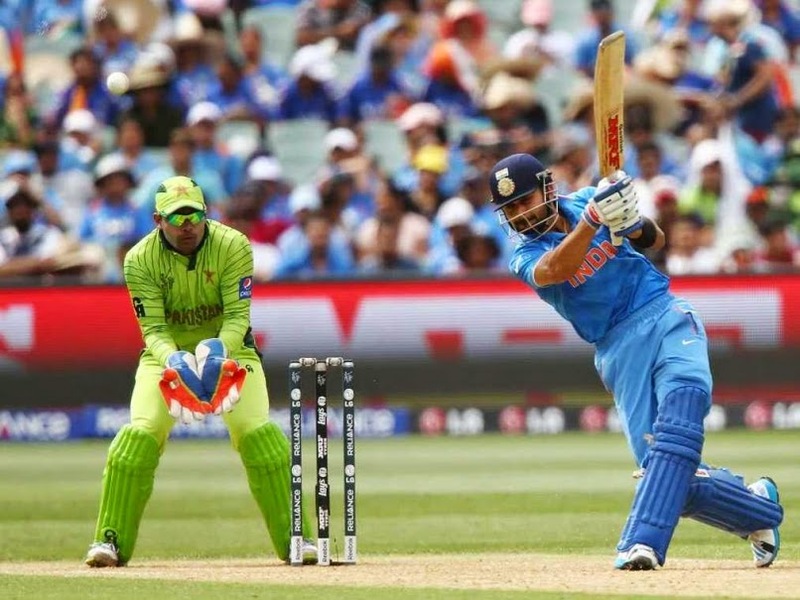 Despite lack of runs in the lead-up to India's title defence, Kohli looked confident and was not scared of taking on Pakistan's most dangerous strike force, Mohammad Irfan. Kohli is known to flourish in pressure situations and that is what teammate Suresh Raina was banking on. The left-handed batsman had said his colleagues were not worried about the star batsman's declining form. In fact it was Raina who came out to bat at the fall of Dhawan's wicket and stitched another explosive partnership with Kohli. India were cruising and Pakistan's bowlers failed to show any kind of spark on a flat pitch at the Adelaide Oval. Raina played the perfect role to help Kohli's dominating mood - he rocked back on the backfoot to punish the pacers and stepped up the gas when Yasir Shah came back into the attack, hammering the leg-spinner for a six to move into the 40s. Soon after Kohli brought up his hundred, Raina turned on the screws further smashing Shahid Afridi for his third six of the innings to bring up his 34th fifty off a mere 37 balls. India's usually strong batting line-up was a cause for concern before the tournament started but Kohli and Dhawan played special knocks to dispel all fears. 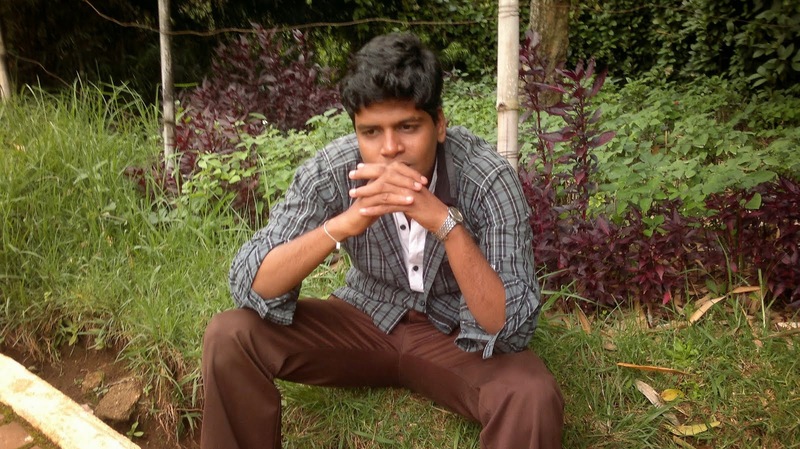 Now the onus is on the bowlers to come good and make a difference to the World Cup campaign. This is a crucial match for both teams from the perspective of the World Cup - it also has massive historic connotation as India have never lost to Pakistan in five World Cup matches.